The history being made in the South was not the history that the slaveholders and cotton factors told themselves they were making, but another sort of history entirely. It was a history being made by their black slaves. And through that real history was evident every day in the physical labour with which those slaves created “the country”, it was yet hidden from view by the forced conversion of their labour into wealth credited to the substance of their masters and by a stage-prop sovereignty designed to convince them they were alone in the world. 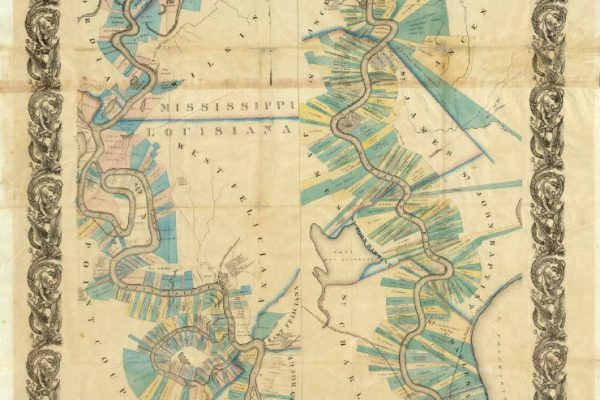 The commercial geography of capitalism and slavery in the Cotton Kingdom was shaped in dialectical interchange with the ecology of the Mississippi Valley. Writing within a Marxist framework Johnson is able to simultaneously demonstrate the way that the labour of the slaves created enormous wealth, transformed the physical landscape and, at the same time, created the basis for a political and economic crisis. 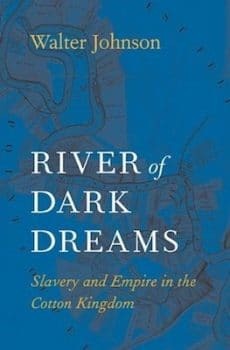 Constantly the slaveholders were fearful of rebellion-the shadow of Haiti hung over everything they did-and the fact that only extremely violent oppression of the slaves enabled the slaveholders to extract the wealth they required, meant that rebellion as an individual or a collective act was never far away. But Johnson also argues that the slave economy was so locked into wider capitalist networks, that it also faced other potential threats. In a magnificent chapter on the steamboats, Johnson shows how there is a crisis of over-accumulation as more and more ships are built. The ship owners fear the hit to their profits as more and more craft pile into the Mississippi for a slice of the profits. 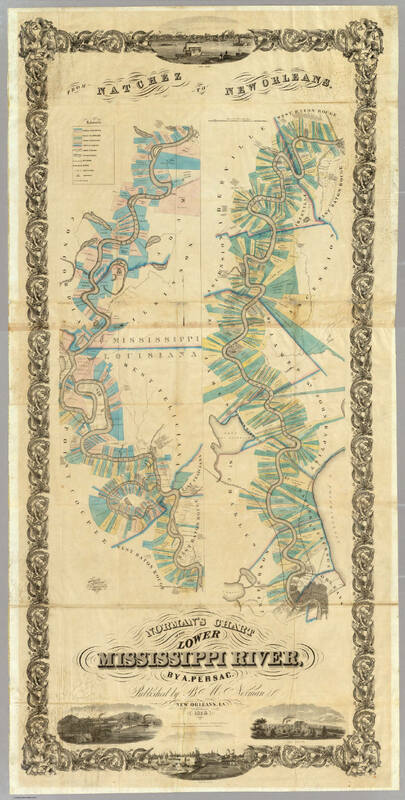 Norman’s Chart of the Lower Mississippi River by A. Persac. Published by B. M. Norman, New Orleans, La. 1858. Entered…1858 by B.M. Norman, Louisiana. 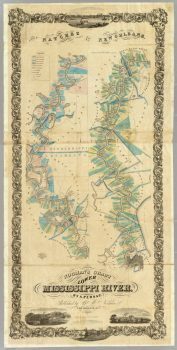 Credit: David Rumsey Historical Map Collection. Thus the slaveholders are part of a dynamic economic system whose ups and downs have real impacts on their profits and way of life. The fluctuations of the price of cotton in Liverpool are transmitted back over the Atlantic and up the Mississippi through countless middlemen, threatening the livelihood of the slave owners and the slaves themselves. Johnson shows how life on the steamboats were a microcosm of the “riverworld” itself, with “anxieties over race and class” among the passengers highlighting their distorted views of the wider world. Some of these sections are difficult reading: the parts dealing with the hysterical panic caused by black people with lighter skins being sat in the wrong place, or white passengers mistaking a black person for someone of their own colour, give a glimpse of the horrifying reality of racialised capitalism-which graded everyone through race and class. Adding to this horror are the devastating explosions of the steamships themselves, frequently caused by owners cutting costs to maximise speed (and thus profits) and leading to the deaths of thousands of passengers and their slaves. Johnson shows how the nature of the slave economy undermined its own profitability by destroying the fertility of the soil. “Reformers” raged against this, arguing for a more liberal policy-not towards slaves-but instead questioning the short-termism of the slaveholders. Pamphlets and newspaper articles argue for a better use of fertiliser and waste, the mixing of cotton crops with animal husbandry to improve conditions, but never mention the treatment of the slaves. This after all, was an economy where “human life was turned into cotton”. Johnson uses metabolic rift theory here to great effect demonstrating how the wider capitalist economy destroys both the natural world and those who labour on it. The final section of the book put these discussions into the context of the wider world. In thinking through how they could protect their slave economy as it was threatened by abolitionists and revolutionary movements, greedy eyes looked out at South America and the Gulf of Mexico. Politicians, intellectuals and adventurers could get a lot of applause by arguing to force Cuba or Nicuragua into becoming part of the Mississippi slave economy. Debates between the expansionists and the reopeners were in part about the source of the slaves themselves (the reopeners wanted to restart the African slave trade) but were also about how best to expand the slave economy to bring more wealth back into the Mississippi. They wanted to be as independent of capitalism’s wider networks as possible, so that Liverpool or New York couldn’t put a stop to their profits. Johnson argues however that this white-supremacist ideology was not one that benefited all white people. He shows how carefully this sort of argument was used to try and bind all white people to the slave economy, against the slaves. Yet for many of the poorest white people this was not reality-in fact poverty and unemployment were the lot for many as slaves were used to do work for free. Hence, reopening the slave trade for the slaveholders was, in part, about trying to cheapen the cost of slaves so that poorer white people could own them. The knots that the ideologues of slavery twisted themselves into while trying to justify the institution are horrible. But it was these beliefs that led to adventurers trying to invade Cuba, and ultimately to the secession of the southern states and the American Civil War. Walter Johnson’s book is a brilliant investigation into the reality of slavery and the slave-economy. He shows how racist ideology was part and parcel of justifying its existence, and demonstrates its irrationality in the context of wider capitalism. He also celebrates the struggles of the slaves themselves who fought to free themselves from the madness of racialised capitalism. It’s a book that tells us a lot about the development of the United States itself, and many of the current problems with racism, but it also shows how right Marx was to point to capitalism’s birth “dripping in blood and dirt”. I highly recommend it. Martin Empson is the author of "Kill All the Gentlemen": Class Stuggle and Change in the English Countryside (London: Bookmarks 2018), Land and Labor: Marxism, Ecology, and Human History (London: Bookmarks 2014) and the pamphlet Marxism and Ecology: Capitalism, Socialism and the Future of the Planet (London: Socialist Workers Party 2009). He frequently blogs on books at https://resolutereader.blogspot.com.